China launched a Long March 2C rocket Sunday with a radar-equipped environmental satellite to monitor the globe for natural disasters, according to state media reports. The Huanjing 1C satellite, mounted on top of a Long March 2C rocket, lifted off at 2253 GMT (5:53 p.m. EST) from the Taiyuan space center in northern China's Shanxi province, according to Xinhua, a Chinese state-run media outlet. Liftoff occurred at 6:53 a.m. Beijing time on Monday. 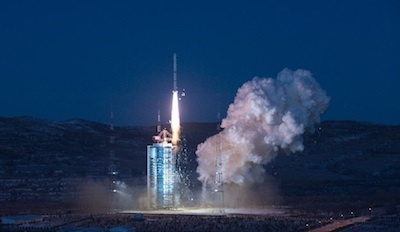 The 138-foot-tall rocket carried three payloads, including the Huanjing craft and two secondary passengers, state media reported. The launcher reached a polar orbit about 300 miles high, according to U.S. military tracking data. Xinhua declared the launch a success. The Huanjing 1C satellite is fitted with a synthetic aperture radar instrument designed to peer through clouds and take images of Earth's surface day-and-night in all weather conditions. It joins two Huanjing satellites with optical imagers launched in 2008. The disaster-monitoring fleet provides data on floods, wildfires, drought, typhoons and landslides. Imagery from the Huanjing satellites are shared with other countries as part of an international framework for disaster response. Huanjing means environment in English. Two small technology demonstration payloads were also sent into orbit on Sunday's launch, which marked China's 16th space launch of 2012. One of the satellites, named Xinyan 1, will test unspecified new space technologies. Another payload, Fengniao 1, consists of two microsatellites to prove formation-flying techniques.